Latest Gundam game news incoming. 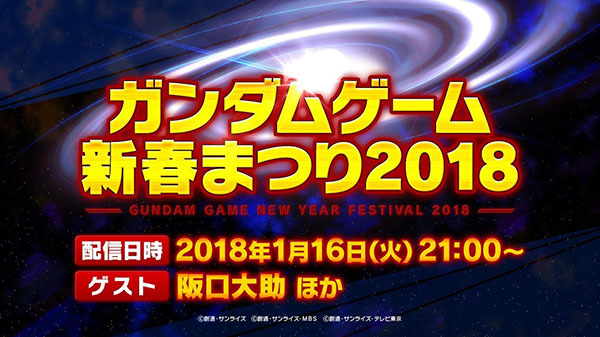 Bandai Namco will host a “Gundam Game New Year Festival 2018″ live stream on January 16 at 21:00 JST, the company announced. You will be able to watch it on YouTube, LINE Live, and Bandai Channel. The live stream will feature the latest information on Gundam console games alongside special guests. Voice actor Daisuke Sakaguchi and others are slated to appear. Further details will be announced at a later date. The latest Gundam console game to be released is Gundam Versus for PlayStation 4, which launched in July 2017 in Japan, and September in the Americas and Europe. It still receives regular new downloadable content. Mobile Suit Gundam: Battle Operation 2 was announced for PlayStation 4 in September, but has yet to be detailed outside of confirmation that it is digital-only and requires an Internet connection. While Bandai Namco did not explicitly state whether a new Gundam game will be announced, the official Twitter account for the Gundam Breaker series retweeted the event.